← 317 "The Regina Monologues"
Homer walks through a bunch of doors to get to a telephone booth, and it teleports him to the couch. The Fat and the Furriest is the fifth episode of the fifteenth season. It originally aired November 30, 2003. "Homer becomes the laughing stock of the town when a wild bear humiliates him. But when he seeks a rematch, Homer bonds with the animal and tries to save its life." Having bought Marge the same thing as Bart and Maggie for Mother's Day, Homer goes to Sprawl-Mart and buys her a "Kitchen Carnival" on the advice of Patty and Selma, a machine that produces cotton candy, caramel and deep fried things. Eventually Homer uses it to make a giant ball of deep-fried, caramel-covered, cotton candy. The ball is much too big for the family to eat, and it gets dirty. Finally Marge insists Homer get rid of it. He takes it to the dump, and is confronted by a large, angry grizzly bear, from which he cowers. 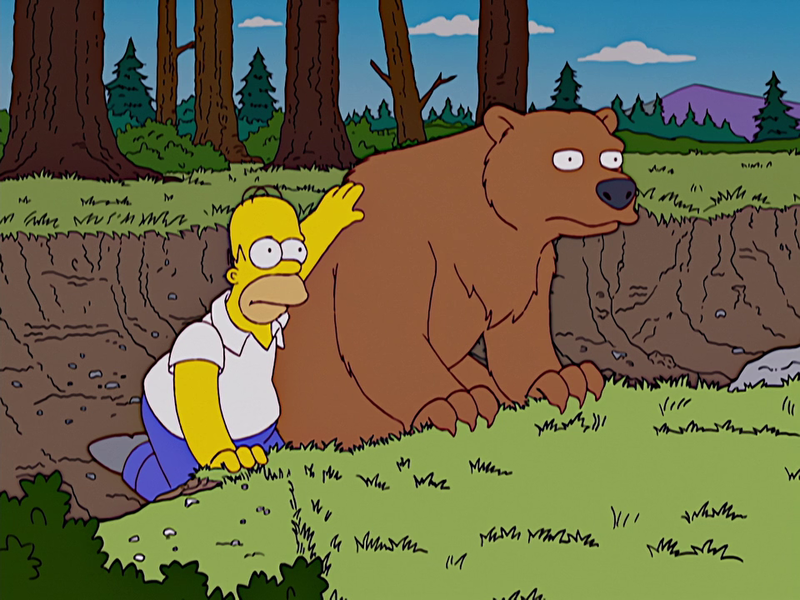 The bear eventually wanders off without attacking, apparently bored by Homer's crying. Homer becomes a nervous wreck, hallucinating and seeing bears everywhere. To make things worse, a tape was made of him cowering from the bear, and his coworkers and Bart's friends make fun of him incessantly, finding Homer's completely understandable fear of being mauled by a massive bear to be an act of cowardice. Grampa tells him to confront the bear, and Homer eventually does so, contacting a hunter named Grant Connor. He then makes a suit of armor out of household junk. Ignoring Marge's requests that he not fight the bear, he sneaks out of the house, joined by Bart, Lenny and Carl, and goes to fight the bear. The four of them make camp in the woods. As his homemade armor is hot, Homer eventually takes it off and bathes in a stream, where he is again attacked by the bear. With Bart, Lenny and Carl dancing to the radio and paying no attention, the bear drags Homer to his cave. Homer discovers that the bear is only angry because of a painful electrical prod attached to his ear. In the mean time, Marge and Lisa have discovered Homer, Bart, and the suit of armor missing, and Lisa hires Grant to help track Homer down. Freed of the electrical prod, the bear and Homer become friends; going through garbage (Homer, however, is the pig out of the two and the bear, repulsed by his manners, hands him a spoon), and going on friendly walks. Homer later decides to take the bear to a nearby wildlife refuge, but on the way, they are attacked by Grant, Cletus and a number of other hunters. Homer dresses the bear up in his armor, which blocks the gunfire and allows the bear to reach the wildlife refuge, where he is promptly attacked by an elephant, but then fights back against him. Modified on May 21, 2017, at 09:33.